Champions in this category are manufacturing companies or individuals that have or who have, significantly increased energy savings or helped to reduce carbon footprint within manufacturing facilities (more detailed Champions features can be found in the 2018 Champions Yearbook). 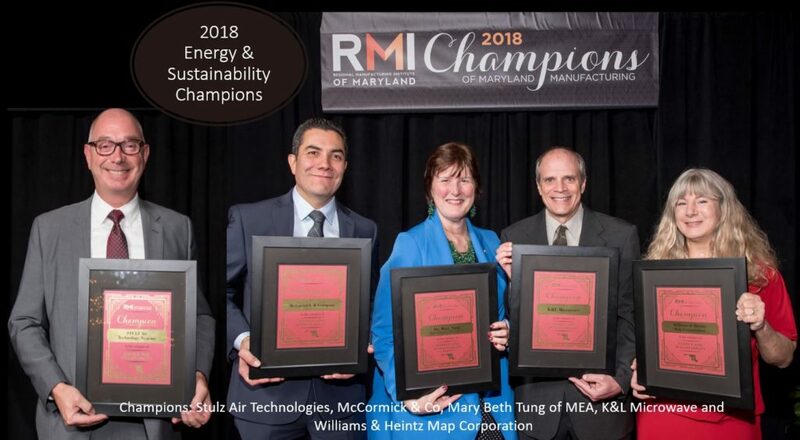 Mary Beth Tung, as head of the Maryland Energy Administration, has been an avid leader and influencer advocating the importance of energy efficiency for Maryland’s manufacturers. Wicomico County’s K&L Microwave has a phenomenal environmental track record and has reduced energy usage by a whopping 36.4% between 2011 and 2017. Additionally, K&L has sustained a 20 percent reduction in the amount of coolant disposed of and purchased and recycled an average of 91K pounds per year of scrap brass and aluminum. Baltimore County’s McCormick & Company sees sustainable manufacturing as one component of a larger corporate social responsibility effort. While many companies believe it is too expensive to be sustainable, McCormick realizes that there are many opportunities for “triple bottom line” investments that are good for the environment, economy, and people. Frederick County’s STULZ Air Technology Systems is a leader in design and manufacture of environmental control equipment while they have also installed solar panels generating greater than 20% of the total electricity usage. Prince George’s County’s Williams & Heintz Map Corporation is ISO 14001 certified and a Maryland Green Registry Member which uses green materials and sustainable environmental practices that combine sound business principles with environmental stewardship.